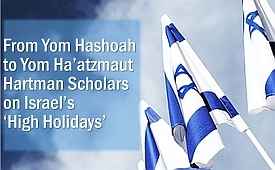 In these special articles and videos, Shalom Hartman Institute scholars explore the meaning of Israel's Independence Day and the many other holidays this time of year. We recommend that you begin with Donniel Hartman's essay, "From Yom Hashoah to Yom Ha'atzmaut - the new 'High Holidays' of Israel. This article frames the way that many in Israel view this time of year, and offers a guide to those outside Israel of the depth and meaning of these holidays in Israel. Between Personal and National: How Do We Create Meaning Through Memorial Ceremonies?